Archibald Alexander Ritchie and Paul S. Forbes filed a claim for both the 21,200-acre Rancho Guenoc grant and the adjoining, much smaller, 8200-acre Rancho Collayomi on which Middletown is now located, in 1852, under new land title laws established with California’s statehood. They were not approved until 1863 and 1865. Ritchie sent Robert Sterling, nephew of a business partner, to manage the sprawling property. We know nothing of Forbes, but Ritchie's life in San Francisco, Benicia and Suisun drew lots of attention. Ritchie was born in New Castle, Delaware, on Jan. 28, 1806. His well-established parents expected him to join the navy when he reached maturity, but at age 13 he ran away and hopped a ship bound for China. It must have been “a calling”; five years later he was in command of the good ship Treaty, owned by Philadelphia’s Marine Insurance Company. In 1831, he married a Philadelphia girl, Martha Hamilton, and when their first child, Eliza, was born the following year he was bringing a shipload of tea and silk from China. Ritchie became resident agent in Canton, China, in 1838, for Philadelphia shippers and importers Platt & Sons whose ships carried hides, tallow and otter skins from California to China and returned highly desirable goods back to the new state. His family joined him there and at least four of the Ritchies' seven children were born there. In 1847, Ritchie returned his family to Philadelphia and found himself drawn to California by the gold rush. Older than most gold seekers, he quickly became active in San Francisco's commercial world, and although not himself a member was involved with the first members of the vigilantes committee in 1851, whom he described as "the richest, most influential, orderly and respectable citizens." He reverses that opinion a year or so later. In 1850, Ritchie had bought both the Callayomi and Guenoc grants from Jacob Leese for $14,000, and also the massive Suisun land grant from General Vallejo for $50,000, as well as several smaller properties in Napa County. He promptly sold part of Suisun to Capt. 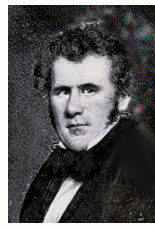 Robert Henry Waterman, who had also long been involved in the China trade. Waterman's nephew, Robert Sterling, would be involved with Ritchie thereafter and Waterman was named executor of Ritchie's estate. At that same time, he purchased a prime lot in Benicia and was involved in getting that burgeoning town named state capitol. He implored his wife to bring their children to live in the impressive home he'd had built there. About the time they arrived, in 1854, the home burned; it was reported to be an act of arson by infuriated "squatters" Ritchie had run off the Suisun property. The Ritchies commissioned the finest home in San Francisco's new South Park development, which was completed shortly before Ritchie's death in 1856. Until 1873, Martha Ritchie lived there after her husband's death and was praised for her "elegance and refinement" in San Francisco's first social register in 1879. On July 9, 1856, nearing Napa from Sonoma, Ritchie was thrown from his buggy and died instantly. The San Francisco Herald, then the city's leading newspaper, noted the death of a "long prominent merchant of San Francisco and a gentleman owning large interests in several portions of the state." He was buried in Yerba Buena Cemetery, now the site of San Francisco's civic center from which all bodies were moved to Laurel Hill. Drawn from A.A. Ritchie, California Pioneer, by Dr. Albert Shumate, Society of California Pioneers, 1991.